"Named to Kirkus Reviews' Best Books of 2014"
Helen Engelhardt is delighted to announce that her memoir has been published by Blue Thread Communications, an imprint of Jewish Currents magazine. Over twenty-five years ago, in an act of terrorism that stunned the world, Pan Am 103 exploded over Lockerbie, Scotland, killing 270 people. The Longest Night begins with the author receiving the nightmarish news that her husband, Tony Hawkins, was one of those 270. How is she going to tell Alan, their six year old son? Helen Engelhardt takes readers on an intimate year long journey of grief, outrage and loving remembrance, against a backdrop of international politics, media frenzy and courtroom negotiations. To keep Tony present for both herself and Alan, Engelhardt mixes memories, documents, recordings, and headlines in a narrative that is, at once, deeply personal and profoundly universal. The narrative describes the first year after Tony’s death, as she and Alan learn how to live without him and begin to participate in the newly formed lobbying and emotional support group, The Victims of Pan Am Flight 103. Counterpointed against the twelve months of 1989, are the first seven and final five months of her sixteen year marriage. The memoir also includes a chapter about what the group has achieved and the challenges which remain, a Time Line and a Bibliography. "I started reading and COULD NOT PUT IT DOWN!!!! But I have to get back to my book." The book is a treasure, just a treasure, a beautiful book in every way. couldn't put your book down; it is riveting. Your attention to detail makes one feel one is there. It's a labor of love which will mean an awful lot to a lot of people, as a witness to what's still going on. Your account brings back the feelings, the sights and sounds of that time with the resonance with our own loss. I see the need for this story to be told until the truth is told. Thank you again for this treasured book. It makes a worthy companion volume to your audio book. It is much appreciated. David Gould is a friend who hosted Alan and Helen during their second visit to Lockerbie in 1990. 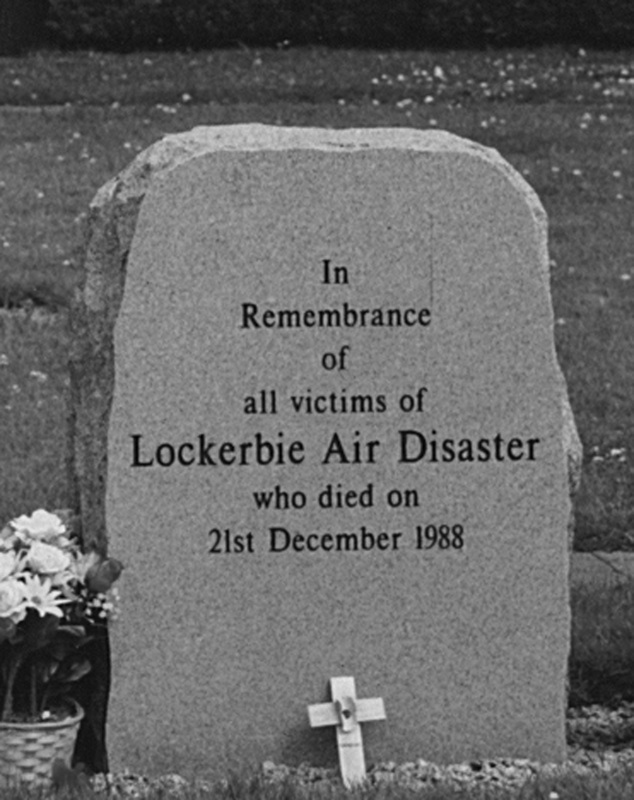 David, a social worker, living in Lockerbie, was one of the first people out on the street after parts of the plane landed in the middle of the town on December 21, 1988. David immediately organized a center where survivors could be brought, and he made himself available for counseling and emotional support. Available in hard cover and soft cover. This book is also available in audio, a beautifully produced and designed 5 CD set has a time line of events and pictures of important elements of the story. a hard or soft cover book in the same order. Also, postage savings with combined shipping. In 2009, Engelhardt produced an audiobook version of The Longest Night, excerpted from the full memoir. The audiobook became a finalist for an Audie in the Best Original category in 2010. It was directed by award winning audiobook producer Jeffrey Hedquist. Engineering and Sound Design by David Shinn. "The Longest Night is situated in an entirely original place where memoir meets documentary, and the result is powerful... full of insights on love and grief... the listening experience is effortless. I think that The Longest Night makes a unique contribution to the literature of memoir in audio." "Helen Engelhardt, a gifted writer and story teller, has brought us, with The Longest Night, an eye and heart witness account of a harrowing moment in our collective history. 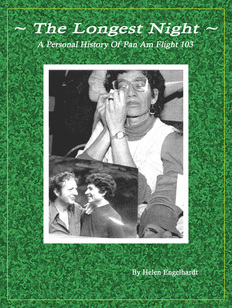 This is the story of her beloved husband who, through accident and quirks of fate, decided to board Pan Am Flight 103. Neither he nor anyone else who made the same decision survived the terrorist bomb that was to send them hurtling through the sky to unsuspecting earth in Scotland. With the craft of a great story teller Engelhardt unfolds the stories of those whose lives ended and those whose lives as they had known them also came to a burning halt. In these times, the oral tradition begins to take back its rightful place as a vehicle for recording history, instilling values, teaching lessons, focusing attention, providing diversion, and creating community. Engelhardt is a leading star in this revival."